A Costa Rica vacations is not only about breathtaking landscapes, tremendous beaches and astonishing volcanoes, but it is also having a story to tell. Your Costa Rica family adventure packages will be full of fun and memories that will remain during the whole life; our landscapes loaded with green nature, clear beautiful water and amazing beaches, rivers, mountains and rural paths will constitute, your perfect scenery. We invite you to continue reading this article, as we want to show you why you have to choose some Costa Rica family holidays. We are saying that this is the best destination for families, and remember that we have all you need; it does not matter, if you are travelling with friends, your couple, or if you are a solo traveler; the important thing, is to know that this is your next destination. 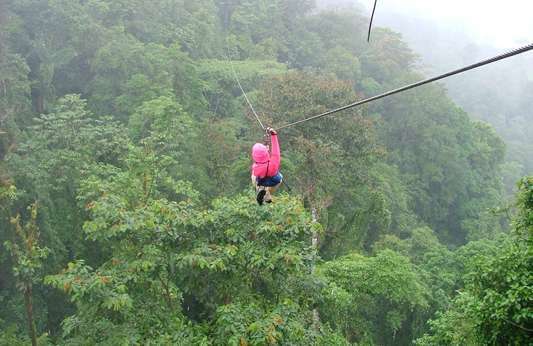 These words are used without distinction, but usually canopy tours are into forest where you are sliding over the tree canopy and the zip line does not pass over tree canopy and most of the platforms in the canopy tour are on a tree, while the platforms of the zip line are not, it could be over a canyon, for example. Anyway, this is the most popular activity for family adventure, it does not matter if you are on the beach, staying in the city of San José or its surroundings, or the most secluded area, zipline canopy tours can be done in almost all the areas in our country. If you are into adventure, the canopy tour is the perfect activity to start. This zip line ride does not require any particular skills; you just enjoy the views, the speed and your body full of adrenaline. What makes it popular, especially for families, is that as there are many different companies and sceneries to do the activity, with different heights and distances. Some of them allows young children, as it is a safe tour and children could slide at the same time with an experienced guide or an adult of its parents or familiars. Adventure lovers always consider this activity while in Costa Rica. We have some of the best rivers in the world with warm waters. We can mention Pacuare which is known for rafting competitions and also, due to its scenic beauty, but there are other rivers like Corobicí, Balsa, Tenorio, Sarapiquí and Savegre. Professional and experienced tour guides make of them a safe, fun and memorable vacation tour. Costa Rica family adventure holidays should try it. This is a team effort, all the team should be coordinated to paddling at the same time and must be focused to hear the guide instructions, this is something similar to a small boat. There is the guide in charge of going in the right way, and the team is helping to go straight while your adrenaline is at its maximum and you are laughing, get a lot of fun, and admiring the natural beauties. You just have to consider that depending on the destination that you will visit, there are rivers that allow children over 8, 10 or 12 years old. Each one is different from the others, so it does not matter if you take two or more rafting tours during your vacation, just take into consideration that it requires physical effort and be on a good shape. Costa Rica is the place where the unexpected is commonplace. In these rich waters you will have from small to big animal encounters, visibility in the 30 to 120 foot range and the abundant marine populations will astound even the most experienced divers. The most popular diving sites are: Nicoya Peninsula, Osa Peninsula, Coco’s Island and the beautiful Caribbean coast. The perfect Costa Rica family vacation itinerary should have some of wildlife encounters, be close to the nature, to experience and learn from our “mother nature”. To do this activity you should have license, but if you want to come and get your license here, we can offer you the course to get it. Close to our national parks, there is most of our natural richness, that is why Coco´s Island constitute the principal and best spot to do it, however is complicated to have availability to get there, it requires a minimum of 10 days staying there and takes around two hours driving from San José and then 36 hours from Puntarenas province, on a ship. Nevertheless, our second and most recommendable spot to do diving is Caño Island in Corcovado area, this is also very good to do snorkeling during your vacation packages. Surf has become a national sport, and Costa Ricans are extremely good at it. Professional surfers offer surfing classes in the best surfing beaches. Recently, the National Geographic named Nosara beach as one of the most valuable destination in the world to have a safe but sensational surfing trip. There are top beaches in Costa Rica to do this sport, there are also beaches used for competitions, and it requires a little bit more experience in the sport; but if you want to have a close experience with the Costa Rica waves, we can recommend you some surf classes, this is something that you will enjoy with your family. Horseback rides allow visitors to experience several spectacular landscapes and fauna encounters within the course of a few hours. Just picture yourself riding through a misty rainforest, crossing creeks, rural communities or just enjoying the views. It is a soft adventure activity, does not require experience because the horses are trained and they know the way that will ride, very intelligent creatures. During your family trip, we can offer you some beautiful landscapes and secluded places to do it. There are also more challenging rides for those who are experienced and consider themselves as “horse lovers”… just remember that you can find everything according to your desires. Tourists can do horseback riding in almost in all the areas, but some of the most recommended locations are: the cloud forest of Monteverde, the world famous beach of Manuel Antonio, La Fortuna where the Arenal volcano is located, and Rincón de La Vieja. Please leave us a comment about this article, and contact us, if you need more information about vacation packages, our travel designers will be more than glad to assist you.